Tourmax is the first flip up adventure on the market conceived for all the eunduro and maxi enduro motorcycles owners. 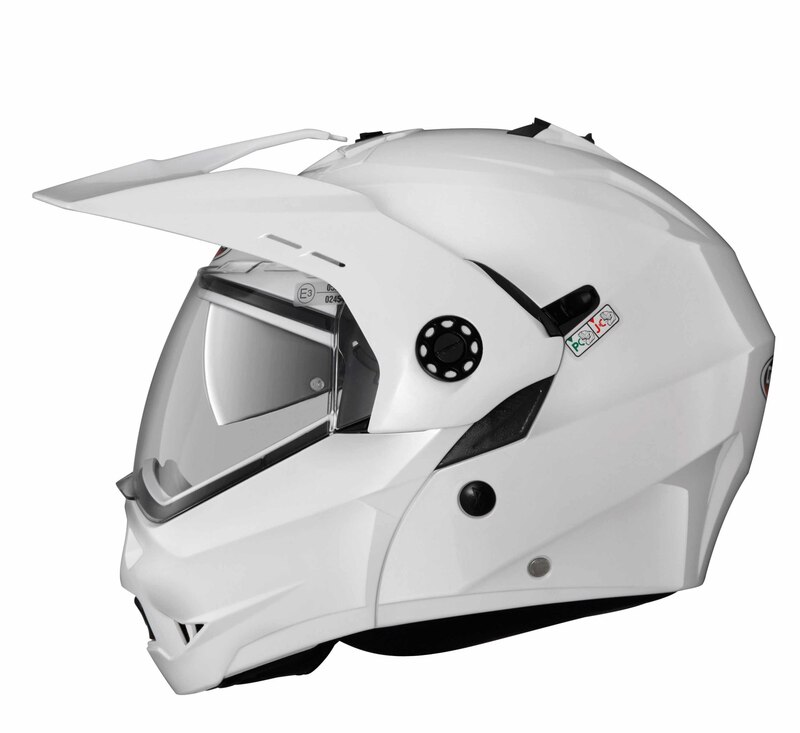 As result of the long experience gained by Caberg, the first Italian company to produce flip up helmets, the new TOURMAX 100% Made in Italy is equipped with a peak that automatically moves close to the visor when opening the chin guard in order to minimize air resistance. 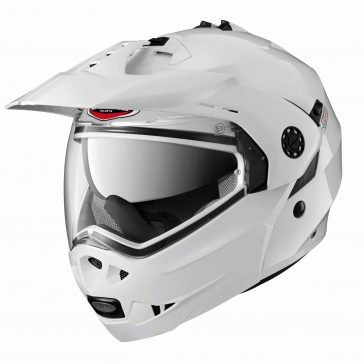 Tourmax comes with the dual homologation P/J which allows you to ride with the chin guard opened guarantying safety thanks to the lever P/J on the left hand side of the helmet. This lever, when in the “J” position, blocks the chin guard in the fully opened position avoiding the chin guard to accidentally close. Tourmax is equipped with the exclusive Double Visor Tech system that, thanks to the easy to use inner sunvisor, allows you to ride always with the right light and in safety. The inner sun visor is treated antiscratch, while the outer clear visor is not only antiscratch but also antifog thanks to the double lens Pinlock. Ventilation is guaranteed by two wide vents placed on the chin guard and on the shell that are easy to maneuver also with gloves. 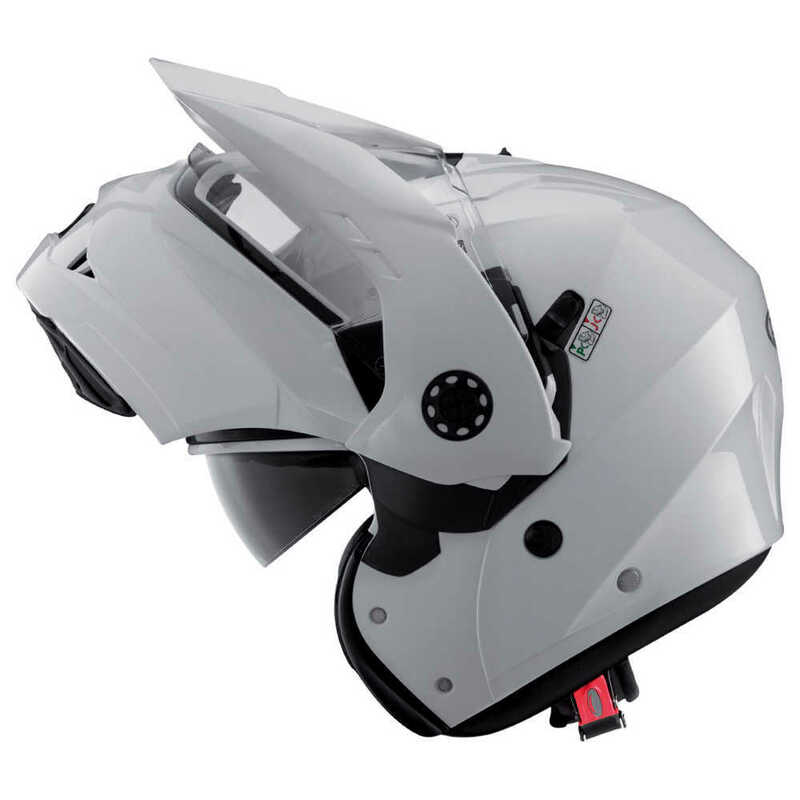 The air is channelled through grooves on the inner liner that ensure perfect ventilation of the helmet. The lining is completely removable and washable, realized with breathable and hypoallergenic fabric for maximum freshness, with reflective inserts at the back of the neck. Tourmax is offered in the single colors: matt black, matt gun metal, and white metal; and in sport graphic versions SONIC with base color matt black and white. Tourmax has a seating to accommodate the Caberg Bluetooth communication system “JUST SPEAK S” which allows to communicate not only with your own mobile phone and your passenger but also to connect to a GPS system, listen to music through your mobile or an MP3 player. Just Speak S is equipped with Bluetooth A2DP that permits to listen in high quality stereo.